A friend in America was also an enormous help. In one of his early emails he called my diagnosis, “a negative thunderbolt requiring you to muster your courage and determination.” “Many years ago,” he wrote, “Jack Kennedy said in a speech that the only predictable certainty in life is the unpredictable certainty of the future. He had that right.” Yes, he sure did. Throughout the 1700’s, taste in the UK had been shaped by the depictions of idealised rural life - rendered by a triumvirate of Italian landscape artists: Claude Lorrain, Nicolas Poussin and Salvatore Rosa. The landscape garden, at its best, followed the principles of composition as understood and demonstrated by these painters: it became the epitome of taste and education, an idea that resonated also with leading families in the Australian colonies. It was held that a landscape painter, by reason of his knowledge of light and shadow, of composition through the relationship of mass and void, and by his sense of line and proportion, would know best how to design garden and landscape. In the United Kingdom the process of transmitting these patterns took place through the increasingly popular Grand Tour of Europe. And that is what I had planned for my small group of garden lovers. But I was forced to allow someone else to lead my tour: a bitter pill. As I started my month of radiotherapy, which was to be followed by months of aggressive intravenous chemotherapy, I was devastated to have to miss that tour, and I grieved for the life I knew and that I had worked so hard to achieve. It was almost impossible to believe that the plans I had made for the next two decades might now be obsolete! I was relieved to start treatment, however. I had been imagining that each tiny ache indicated more bad news. It’s a common phenomenon some call ‘phantom pains’. Even the nurses can experience them when they are first working with cancer patients. I spent many days in tears. There were to be 19 rounds of radiotherapy administered to my brain, in May 2012. 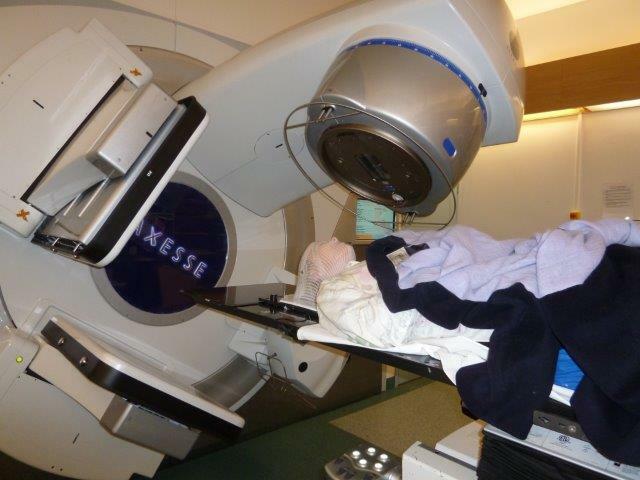 But before radiation treatment could start, I had to be fitted with a mask to allow the Radiologists to target my tumour site with great precision. The kindness, as well as the professionalism, of the nurses and doctors that we encountered cannot be emphasised enough. For the fitting of the mask, we attended what is called a ‘planning meeting’ at POW with a specialist planning nurse, Sandra, and with two assistants. This involves lying on a CT machine, with a wet mask on the face so that the technicians can mark exactly where the radio will target. The mask then sets exactly to the contours of the patient’s face. At each step of the process Sandra or the technician would touch me on the shoulder to let me know they were near, and would tell me what they were about to do. I had been told the machine on which I would be treated is called ‘Bondi’: I was to be treated on the same machine each day. I guessed I would become rather emotionally attached to ‘Bondi’. Again, Ross and I told each other how lucky we are to live in this country. That same day Ross drove me to the city for my appointment at Suzanne Wigs in Castlereagh St. Independently, Suzanne chose for me the same wig I had selected: I hadn’t known it was called ‘Lucky’! I couldn’t help feeling that this was a very good omen. And, after all, I had been brought up by a strong mother to the tune of Helen Reddy’s “I can do anything. I am strong: I am invincible.” And as had become a pattern, I had a lovely afternoon with one of my children. So chin up: onward, without fear! Stay positive! When my radiation treatments started, the two Radiologists were again fantastic, explaining each step. I lay on a bed, similar to that used for a CT scan. The technicians clamped the mask that had been made, just for me, onto my face. 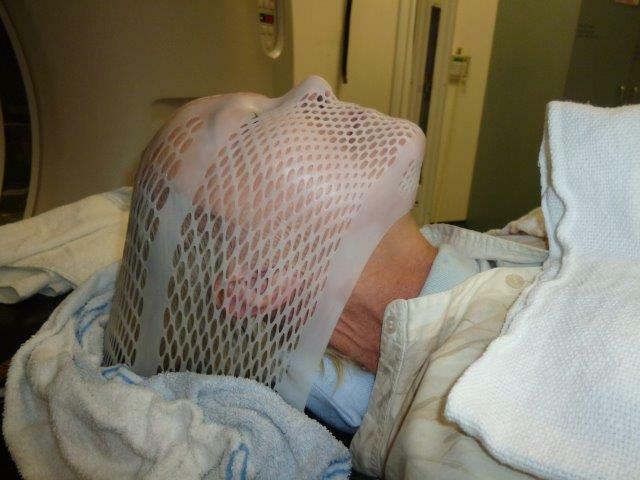 My nose and lips were squashed by the mask, but that is essential, to ensure the patient’s head does not move. For someone who suffers from claustrophobia, that took a lot of deep breathing and some form of meditation. The technicians, one on either side of me, marked up the mask to ensure the exact locations to which the radiation would be beamed. They spoke to each other in numbers and letters: it was like a separate language or code. Fractions of location were crucial. I felt very helpless, completely disempowered, but trusting in their care. Then, eventually, when they went out of the room, the huge machine moved around my head and emitted a mid range sound – not quite a screech. I was determined to think of the entire treatment as an adventure. It was all over in a few minutes, and easy, except for the somewhat disconcerting smell of fire and smoke. The technicians assured me that I was not smelling my brain frying. That was the first of 18 such daily treatments, with a rest day in the middle, to allow ‘Bondi’ to be serviced, and concluding with a 19th treatment; 20 minutes of radiation eight times as strong as each daily dose. The Radiation Oncologist, Dr Colin Chen, believed this last treatment was essential to ensure that no cancer cells remained, lurking in my brain. I spent most of that first day of radiation in tears, not because of the treatment but because of a comment made by a friend that assumed I would not be alive in a few months. If I had not been so upset about that comment the entire treatment would have seemed like an adventure. And, while waiting for my radiation treatments on ‘Bondi’ I would see children being wheeled in to radiation: most were so thin and ill that they seemed transparent. Very upsetting. So very sad. The nausea was almost immediate: after just two radiotherapy treatments. Being ill each morning is draining, both emotionally and physically. And again, I became worried that it was a sign of another brain tumour although Dr Chen assured me that it was not. That being sick at this early stage is normal. My hair started falling out in great chunks. I’d wake up to find blond hair all over the pillow, some of it in my mouth, my eyes. I decided to take control of how I looked, rather than allowing the cancer to dictate my appearance completely. So I asked Suzanne to take it all off – but after the radiation on my head was complete, as, even thinning hair provided some protection for my skull from radiation burns. I was not allowed to drive, which was frustrating. One friend compiled a roster of other friends who would drive me to the hospital. Such kindness contributed to that essential positive attitude. I have since wondered about chronic illness sufferers who keep their affliction quiet. I understand that one wants life to go on as it had before: one does not want people calling in for what might be taken to be a ‘last visit.’ But one also needs support.